Toddle Along Tuesday | My Job! 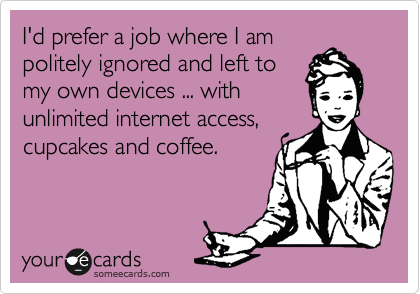 This is a pretty good description of my job, except I work with a lot of people who I adore and we have daily inappropriate conversations about things. Let me start out by saying I graduated college in 2007 with a double major in Psychology and Sports Studies. I had this little dream of one day becoming a Sports Psychologist, probably because I played sports my whole life and my parents completely ruined it for me by the time I got to college. Don't get me wrong, I love my mama. But I think her beliefs of me one day playing for the WNBA were a little less realistic than my 5'4" self actually doing so. So you can believe it was a little depressing/devastating when I decided to not take a basketball scholarship to college and instead enroll in my local community college where I could be close to my boyfriend. You can't be too upset mom, he did turn out to be my hubby/baby daddy. Anyway, the subject of sports psychology really interested me, so that's where I went with my degree. Fast forward graduating, getting engaged and thinking it was probably a good idea to have a job before I got married, I accepted my first job out of college with a commercial real estate company. Within a week of being there I knew I was going to work here forever. Well, you know what I mean. I've been here for 4 years now and I could not be happier. I work in the Brokerage division which means that all those commercial buildings for sale/lease? Yeah all that paper work and marketing goes to me. I cannot express enough how lucky I am. My boss is amazing, work usually involves getting there late, taking a long lunch and leaving early. And did I mention that I recently moved to a 4 day work week? Yeah. I am a pretty happy camper and consider myself the rare few that actually love their job. Maybe it's because most of the brokers here are men and they are just much easier to work with and get along with. Bonus. It's a 5 minute drive from my house which means going home everyday to see the nugget at lunch. So that's how I spend my day in the real world. But if I had to choose my dream job? Vanna White.Always has been my dream job, always will. So glad you love your job! I love that comic! Bring on the cupcakes!